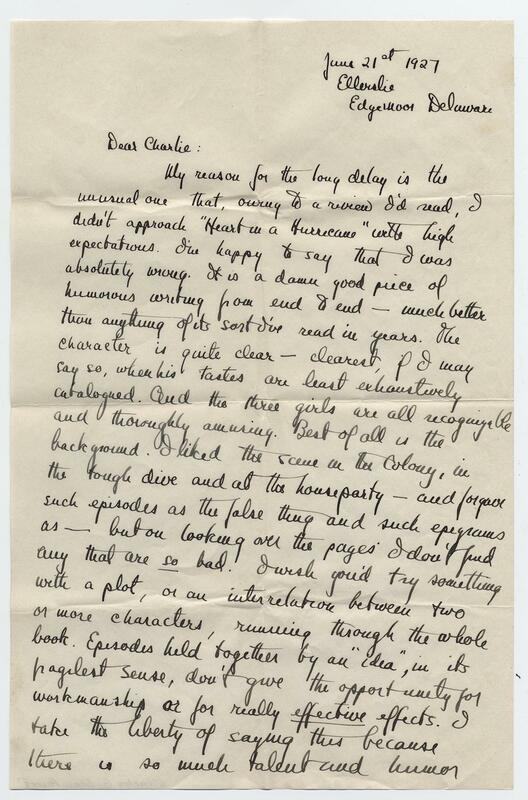 This 1927 letter from F. Scott Fitzgerald to Charles Green Shaw, held in the Smithsonian’s Archives of American Art, offers commentary on Shaw’s recently published novel Heart in a Hurricane. Fitzgerald, who had already published This Side of Paradise (1920), The Beautiful and Damned (1922), and The Great Gatsby (1925), was younger than Shaw, but more successful. The letter is an exercise in constructive criticism, offering compliments layered with gentle recommendations. 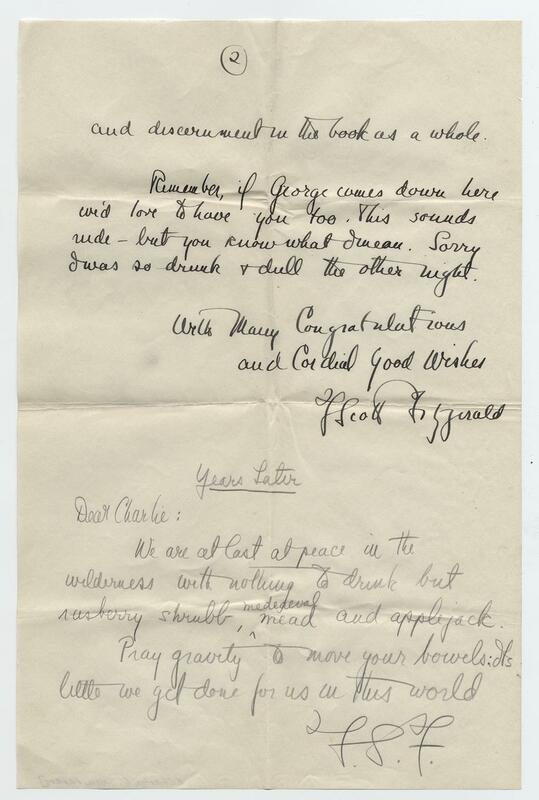 Fitzgerald posted this letter from Ellerslie, a mansion on the Delaware River north of Wilmington where the Fitzgeralds lived for two years from 1927-1929. The postscript is mysterious. Did Fitzgerald forget to send this letter, and add a note before mailing it “years later’? Regardless, his list of rustic alcohols followed by a prayer is not to be missed. Fitzgerald died in Hollywood in 1940. Charles Green Shaw lived until 1974, and had a long and varied career, publishing children’s books and poetry and working as an abstract painter. Dear Charlie: My reason for the long delay is the unusual one. That, owing to a review I’d read, I didn’t approach “Heart in a Hurricane” with high expectations. I’m happy to say that I was absolutely wrong. It is a damn good piece of humorous writing from end to end —much better than anything of its sort I’ve read in years. The character is quite clear—clearest, if I may say so, when his tastes are least exhaustively cataloged. And the three girls are all recognizable and thoroughly amusing. Best of all is the background. I liked the scene in the Colony, in the tough dive and at the houseparty—and forgave such episodes as the false [thug?] and such epigrams as—but looking over the pages I don’t find any that are so bad! I wish you’d try something with a plot, or an interrelation between two or more characters, running through the whole book. Episodes held together an “idea,” in its fragilest sense, don’t give the opportunity for workmanship or for really effective effects. I take the liberty of saying this because there is so much talent and humor and discernment in the book as a whole. Remember, if George comes down here we’d love to have you too. This sounds rude—but you know what I mean. Sorry I was so drunk & dull the other night. Years Later: Dear Charlie: We are at last at peace in the wilderness with nothing to drink but rasberry shrubb, medeaeval mead and applejack. Pray gravity to move your bowels. Its little we get done for us in this world. F.S.F. F. Scott Fitzgerald letter to Charles Green Shaw, 1927 June 21. Charles Green Shaw papers, Archives of American Art, Smithsonian Institution.